There are many good reasons to eat papaya more often. This delicious tropical fruit has a long list of health benefits and is particularly good at aiding digestion with its abundant enzyme content. As its popularity increases, it is becoming easier to find papaya in the fruit section of your supermarket. But how should you pick a ripe one and prepare it and when are the best times to eat it? You can tell when a papaya is ripe, or just about ripe, when the skin is more yellow or orange than green and a light and fragrant smell is coming from the top where the stem used to be. You should be able to press gently near the base and have your finger go in a little, but still be relatively firm. If it is too soft and is already fully yellow/orange with an overpowering sweet smell, it may be overripe and should be avoided. Likewise, avoid fruits with heavy bruising, though some small indents and minor bruising are common and shouldn’t affect the taste. It can be better to choose a papaya just as it is turning yellowish orange and let it ripen on your kitchen shelf, preferably in a spot that gets some sun. 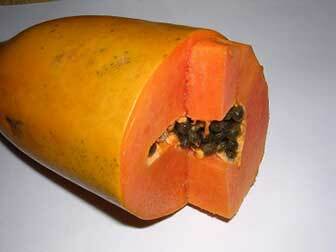 Don’t refrigerate papaya until they are fully ripe. If you’d like to speed up papaya ripening, you can place them in a brown paper bag on the kitchen shelf for a day or two. I also find just keeping unripe papayas next to bananas will quickly ripen them. Start by slicing right down the middle of the fruit on a chopping board. A larger knife is better, but the papaw should cut easily if it is ripe. If you start and it is difficult then it’s not ready. You could cover the cut with some cling film and give it an extra day or two. Once it is split in half, you can scrape out the seeds with a large spoon. Papaya seeds are edible, with a crunchy texture and strong peppery taste and they have some amazing health benefits of their own. Keep them in a sealed container in the fridge if you’d like to use them as a natural parasite treatment and internal cleanser. There’s even research showing they could be an effective natural form of male birth control. With the seeds removed, the papaya is ready to be eaten. If the fruit is fully ripe then the sweet papaya pulp should scoop out easily with a spoon and you can enjoy it as simply as this by the spoonful. For an extra touch of presentation try using a melon ball scoop instead. If you are eating papaya in a fruit salad or another recipe then you can scoop out larger portions with a tablespoon onto a chopping board. Next cut the skinless papaya into either strips or cubes, depending on how you’d like to eat it. Papaya skin is also a rich source of enzymes and is useful as a homemade facial treatment. I always eat right down to the papaya’s skin and then keep it in the fridge to use for my face later. Eating papaya for breakfast makes a refreshing and cleansing way to start the day. Some people like a squeeze of fresh lime or lemon juice over it to add extra tanginess to its natural sweetness. Due to the way the proteolytic enzymes in papaya help break down and digest proteins, it is also an excellent fruit to have for dessert after a big lunch or dinner, especially any meal with meat. 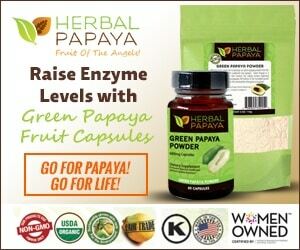 Be aware though of a few papaya enzyme precautions, especially if you are pregnant or on blood thinning medication. There is no need to eat a whole papaya, or even half if you’re saving money (or already full). A quarter should provide substantial digestive benefits and you can wrap up the rest in film or store papaya in a sealed container in the fridge for a day or two. Papaya can be eaten as a fruit breakfast, a mid afternoon snack or a healthy dessert and tastes great just on its own, but there are also some delicious recipes you can use it in. Two of my favorites, papaya and pineapple salsa and ripe papaya salad, are coming up next. DO THE PUMPKIN SEEDS NEED TO BE SHELLED? The pumpkin seeds you get out of your pumpkins at home can be lightly fried in their shells in coconut oil for a healthy snack. Generally the ones you find online will be hull-less. If you are using them in the parasite killing smoothie I would use the hull-less variety unless you have a very good blender.